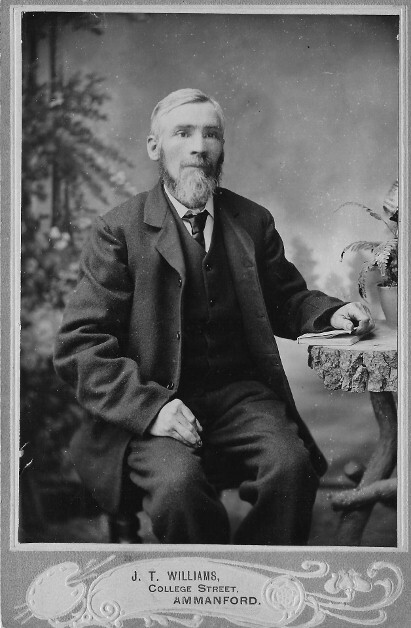 Thomas Jones (1854- ) was the son of John Jones and Rebecca Thomas who married in Christ Church Cwmaman in 1843 (see The Family of John Jones and Rebecca Thomas). 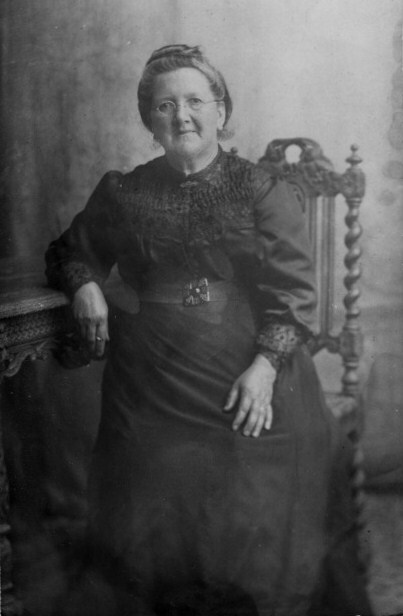 Jemima(h) Davies (1856-1928) was born in Llangiwg (Llanguicke) parish then in Neath registration district (see The family of David and Hannah Davies). Jemimah married Thomas Jones at Christ Church, Cwmaman, Carmarthenshire on April 25th 1874, witnessed by Thomas Jones and David Davies. Both were living in Brynaman at the time of marriage with Thomas Jones (the husband) shown as a fireman. Parents, John Jones and David Davies, were described as labourer and collier respectively. In the 1901 census, the family were at Neyadd (sic) Terrace, (Lower Brynaman) Llanguicke parish, Glamorgan with Thomas Jones Head 47 Tin Works Watchman born Carm Glanamman. David John Jones (1875- ). He married Margaret ? (c.1877- ), born Gwaun-Cae-Gurwen, Glamorgan. 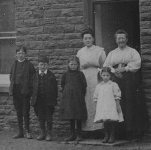 They lived at Brynmarlais, Lower Brynaman in 1911, having been married 9 years with no children. He was a coal miner, hewer. A widowed Margaret Jones born 14 August 1876 kept a confectionery shop at 63 Brynamman Road in 1939. Jemimah Ann Evans (September 19 1901- ) who married Daniel R Evans (May 2 1903-1968) in 1923. She was born on 19 September 1901 according to Banwen School records, living at Neuadd Terrace in 1905 and 55 Brynamman Road in 1908, leaving school for 'home service' in 1915. They were at 55 Brynamman Road in 1939 when Daniel was a coal hewer. Lizzie Mary Evans (April 23 1904- April 13 1973) who married Arnold Lloyd (14 January 1900-1983) in 1923 and had Evan Henry Lloyd (27 February 1924-2005) and a daughter. Lizzie Mary was born on 23 April 1904 according to Banwen School records, leaving for home service in 1918. They were at 53 Brynamman Road in 1939 when Arnold was a Colliery repairer and 41 Maesyglyn, Brynaman when Lizzie died. Evan Henry Lloyd married Mabel Lily Lloyd (1926 - January 14 2014). They both died in Bridgend, Glamorgan. 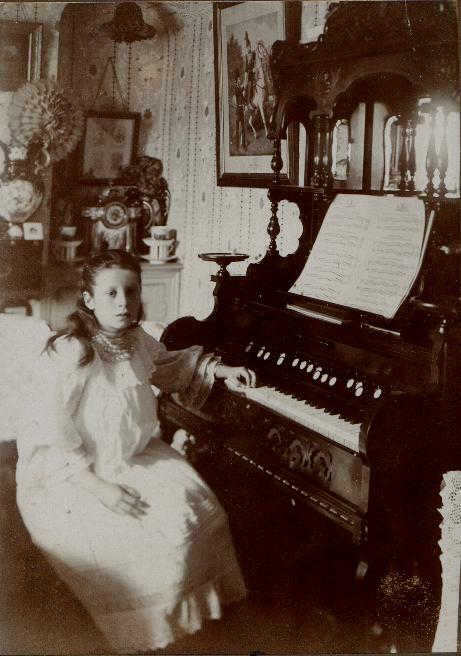 Hannah Jones (9 May 1879- ). At 33 Brynamman Road with sisters Maria Jane and Lizzie Mary in 1939. She remained single. 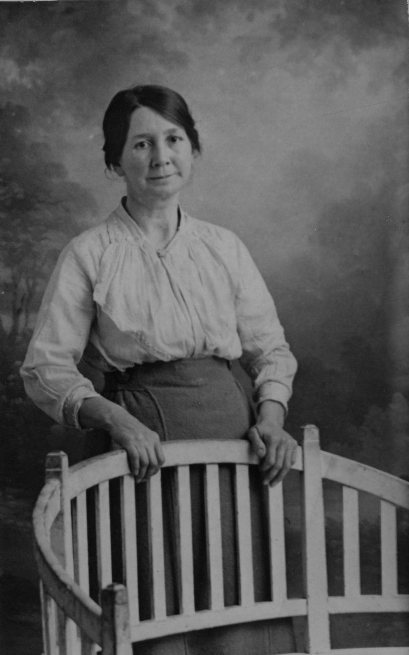 Margaret Ann Jones (19 October 1883-1942). She married William John Pearce (20 December 1883-1951), born Llansadwrn, Carmarthenshire. They lived at Brynaman Road, Lower Brynaman in 1911, having been married 5 years with no children. He was a coal miner, hewer. 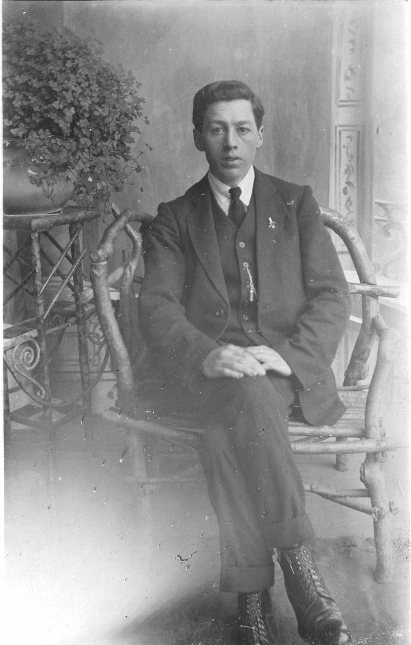 According to probate tecords, William John Pearce of 46 Brynamman Road, Brynamman died 20 April 1951. Probate Carmarthen 28 June to Elizabeth Pearce (wife of George Mansel Pearce). Effects £848 17s 6d. Eleanor May Jones (1909- ). 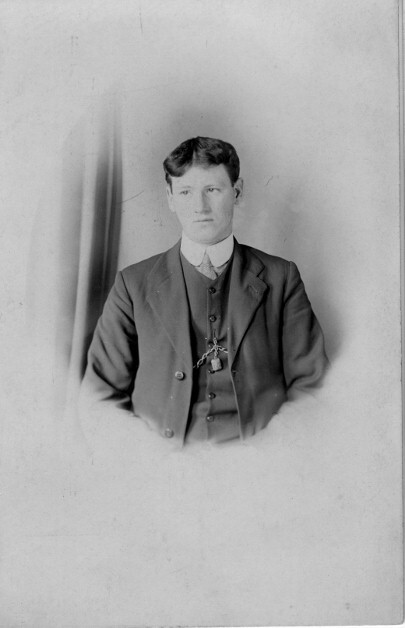 Thomas John Jones (April 15 1910- ) married Gwyneth Davies (10 December 1912-) in 1934 and had 3 children by 1939 when they were at 53 Brynamman Road and Thomas John was a colliery haulier. Nancy Eileen Jones (1920-1986). She married William Thomas Dean (1918-1995), born Tairgwaith, Glamorgan. Beryl F Jones (1923-2008). She married Tegwyn Jenkins (1916- ) in March Quarter 1942. Rachel Miriam Clarice Jones (28 October 1926-25 January 1993). With her parents in 1939. Last Monday week, at the Pontardawe Registry, a quiet wedding took place between Mr. David John Evans, St. David's-row, Gwauncaegurwen, and Miss May Jones, Neuadd-terrace, Brynamman. 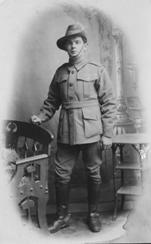 David John served in the Royal Horse Artillery in World War 1. 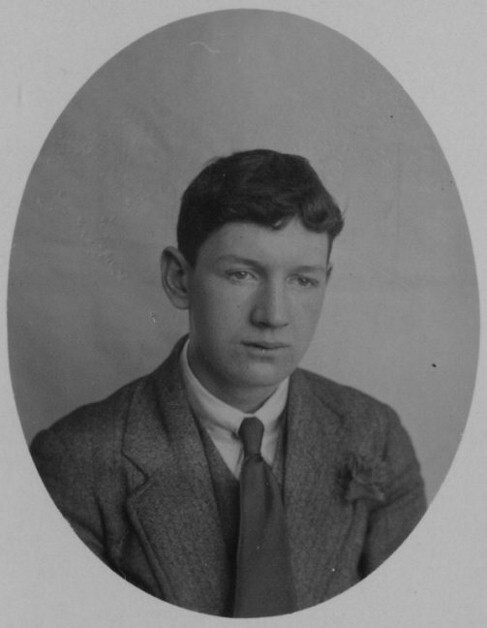 They had Cyril Evans (c.1912- ) who appears on The Electoral Register for Yonge Park, Islington as Cyril Read Evans. They had gone to London in the 1930s. Lizzie Mary was with her sisters Hannah and Maria Jane at 33 Brynamman Road in 1939. She was buried in Islington Cemetery on October 27 1947 aged 59 and David John Evans in the same cemetery on March 24 1958 aged 71. 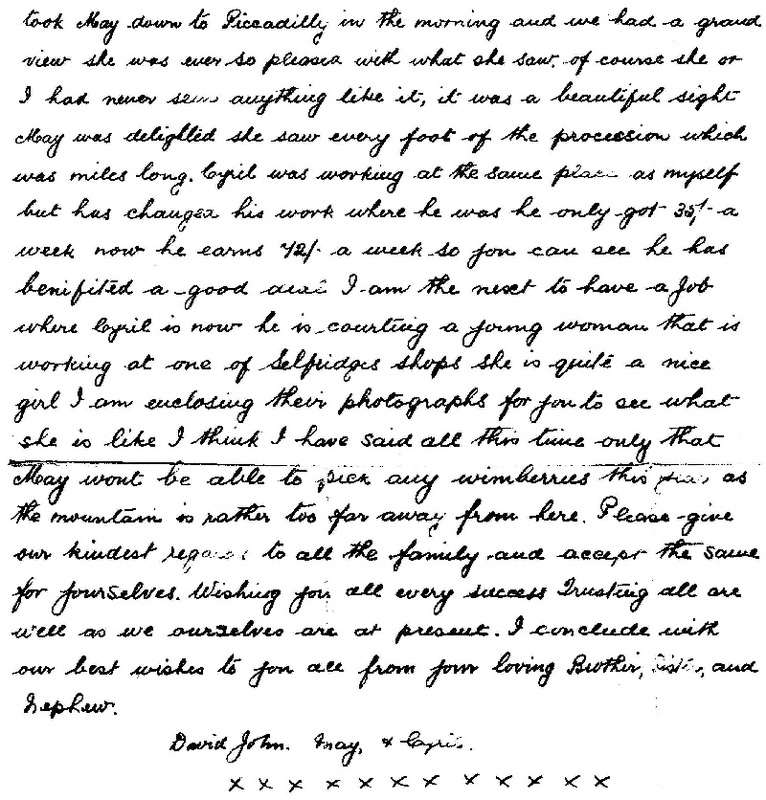 After Lizzie's death David John married Bertha Faulkner. Gwynfor Jones (1922-2009) whose wife, daughters, son and grandchildren are living. Nora Jones (1923-2014) who married Mervyn James Price (1918-1981), born Abercanaid, Merthyr Tydfil, Glamorgan. Son, daughter and grandchildren are living. Thomas Aeron Jones (1926-2004) who married Elizabeth Thomas (Betty) (1929-2007). Daughter, sons and grandchildren are living. Maria(h) Jane Jones (5 January 1896-1940). Born 5 January 1896 (1897 according to some Banwen School entries). 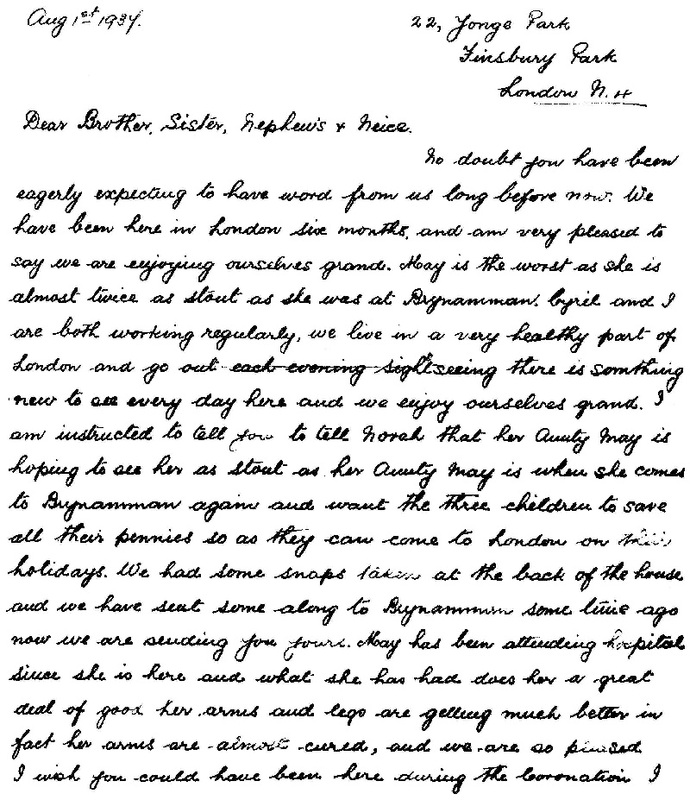 Had a much interrupted education due to illness - seems to have left school in 1911. With sisters Hannah and Lizzie Mary at 33 Brynamman Road in 1939. She remained single. Idris Jones (3 February 1900- 1973). Left school 'for colliery' in 1914. He married Mary Elizabeth Violet Jones (Vi) (13 September 1913-1992), born Llandebie, Carmarthenshire. at 51b Brynamman Road in 1939 with Idris described as a "Colliery underground rider". They had a son Haydn Jones (1937-2013), and living daughter and grandchildren. BRYNAMMAN. Cynhaliodd Ysgol Sabbothol Hermon ei chyfarfodydd chwarterol trwy adrodd canu, &c, y Sabboth diweddaf, ac fe gafwyd cyfarfodydd bendigedig, pawb ar eu goreu yn dweyd am gariad a rhyfeddodau Mab Duw. 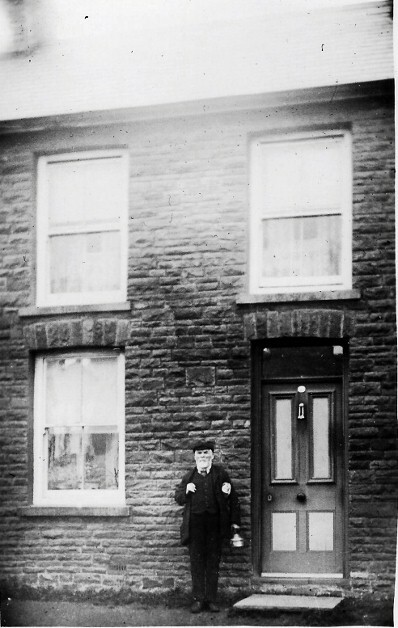 Arolygydd yr ysgol am y tymor diweddaf oedd arweinydd y gan, sef y brawd caredig a llafurus Mr John Davies, Neuadd terrace. Llywyddwyd y cyfarfodydd yn ddeheuig fel arfer gan yr hybarch dad John Harries, Penybont House. Cyfeiliwyd gan Misses Alice Davies a Mary Hannah Davies, a Master Fred Harries, Neuadd terrace, a gwnaethant eu gwaith yn rhagorol, ac yr oedd y bachgen bach Fred yn neillduol dda wrth ystyried mor ieuanc yw. Dechreuwyd cyfarfod yr hwyr gan W Tom Davies trwy adrodd y benod ddiweddaf o lyfr y Datguddiad; adroddiad, Fred Harries; ton, Cor y Plant; adroddiad, Owen Davies; pedwarawd gan Mr Tom Jones a'i gyfeillion; adroddiad gan Evelyn Jones; adroddiad, Willie Davies; pedwarawd gan Mr John Thomas a'i gyfeillion; adroddiad gan Mary Jane Davies; triawd gan dair cyfeilles; adroddiad, Johnny Davies; wythawd gan Mr John Davies a'i gyfeillion; adroddiad, Gomer G Jones; adroddiad, Eleanor Griffiths; ton, cor y plant; adroddiad, Hannah Mary Jones; yna cafwyd anerchiad rhagorol iawn gan Mr James Davies; ton gan gor y plant; anerchiad gan Mr B Davies; pedwarawd gan Mr Tom Evans a'i gyfeillion; yna cafwyd adroddiad rhagorol o'r ddrama Mab Afradlon,' gan Mr Jenkin Thomas a'i gyfeillion, sef Mri Leyshon Thomas, Oliver Griffiths, Willie T Davies, T Thomas, Dd John Jones, Gomer Jones, Willie Davies a Willie Thomas. Yr oedd hon yn rhagorol iawn. Cynaliodd eglwys Anribynol Hermon ei gwyl de, dydd Sadwrn, Medi 25ain, yn yr addoldy newydd, pa un sydd bron bod yn barod erbyn hyn. Mae'r adeilad hwn wedi ei adeiladu rhwng Brynamman a Gwauncaegurwen. Cawsant ddiwrnod da iawn i gynal eu gwyl de eleni eto. Wele enwau y rhai a wasanaethodd wrth y byrddau - Mrs John Davies, Mrs Jones, Mrs Gomer Harries, Mrs Pearse, Mrs Read. Mrs John Griffiths, Mrs Thomas Jones, Mrs John Harries, Mrs Evan Evans, Mrs David J Jones, a Mrs Daniel Thomas.